2. Click Edit on the Category line of your choice. Category Name - This is the name your users will select on their expense. Description (Optional) - A brief explanation of what this category is used for. Reference - Enter a reference that matches your category / nominal code from your accountancy package to link the two together when you import. Default Tax Rate (Optional) - Will be presented as the default changeable Tax Rate to an End-user if populated from the drop-down options. Can be used to enforce the default Tax rate selected for a Category when used in combination with 'Enforce category default tax rate' Additional Settings. Fixed Amount (Optional) - Enter a fixed amount if this category should always be a set rate. When this category is selected, it will auto-populate the amount. 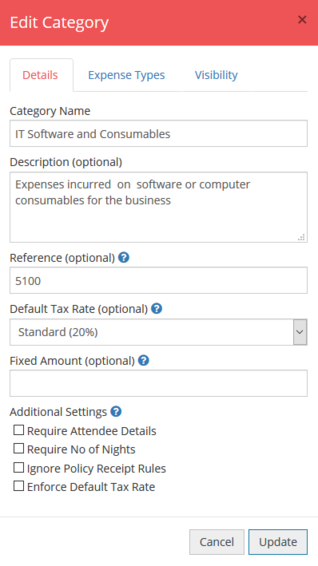 Require Attendee Details - Enabling will ask your user to enter the names of those present on the expense when they use this category. Require No of Nights - Enabling will ask your user to enter the number of nights they have stayed. Ignore Policy Receipt Rules - If you have a policy rule set that requires receipts must be attached to Purchases or Mileage Expenses, enabling this setting will ignore this rule for this category. Enforce Default Tax Rate - If you have set a default tax rate against the category enabling this option will enforce this tax rate is used when the category is selected. 4. 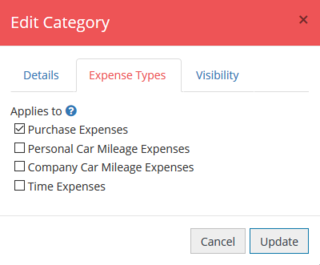 On the Expense Types tab you can select for which types of expenses this category is available to. 5. 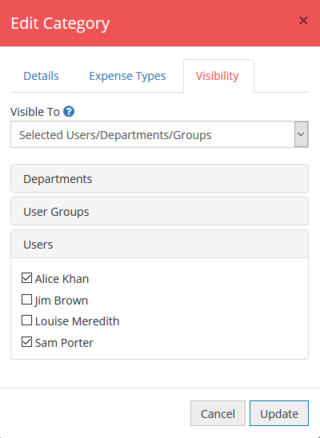 On the Visibility tab you can select which users, departments, and user groups can see this category when completing their expense form. 6. Once you are happy with the settings click Update.